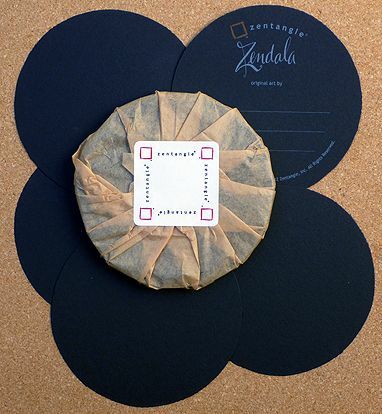 In a recent order, a customer wrote, "Please consider making black Zendala tiles. Thank you." 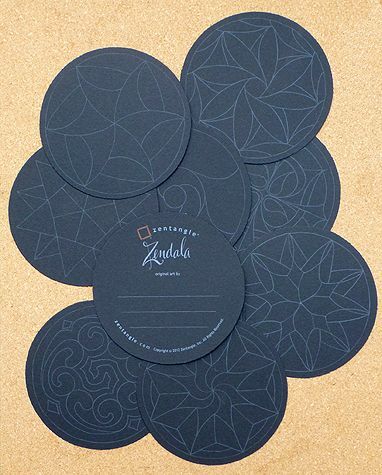 She must have know what was coming, because we now have black Zendala tiles! 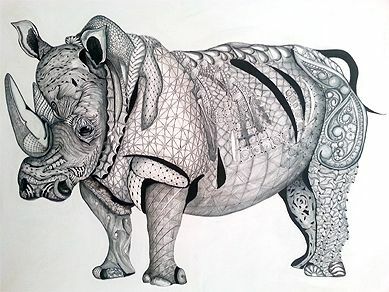 Also, we will be hosting a gallery opening of "Illustrations from The Book of Zentangle" here in Whitinsville, MA, on June 7. Details on both of those items and more, below. We've been working on this for a while and now they're ready . 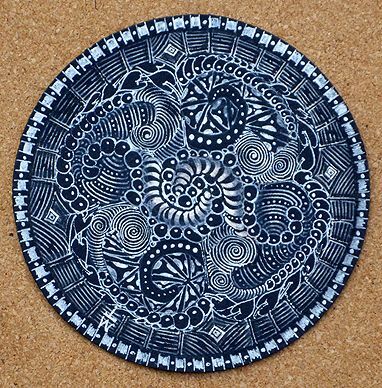 . . Black Zendala Tiles! 21 unstrung black Zendala tiles wrapped in tissue. This is a limited release product and for the next few weeks will be available through our Certified Zentangle Teachers (CZT). More info on this below. Limited Product Release . . . For a While! 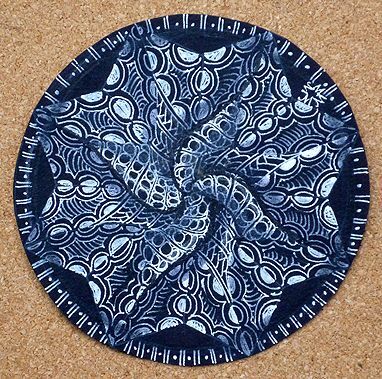 We are making our new Black Zendala Tiles available initially through our Certified Zentangle Teachers (CZT). We will be offering them in our online store sometime in late June, early July. You can find a list of CZTs at this link. 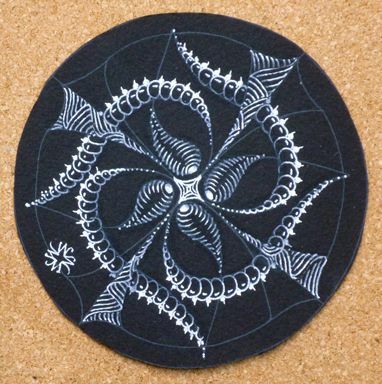 If you can't find a CZT with some supplies locally, drop us an email at info@zentangle.com. We also encourage you to ask your local CZT for a workshop to explore the possibilities with these black Zendalas. For instance, if you haven't already tried "layering" techniques on our black tiles, we enthusiastically suggest you do. By "layering" we mean using the black micron on top of the white Gelly Roll™ ink (once it's nice and dry). You will see this technique used in a many of Maria's tiles. She will also layer the gray Fabrico™ ink over the Gelly Roll ink. The more you explore, the more discoveries and experiences you will have. Here are some more black Zendalas Maria worked on as we were developing this product. Three weeks ago my mum, a friend of mine and my boyfriend went to the Netherlands to take part in a Zentangle workshop of one of your CZTs. Originally we're all from Germany so it was a four hour ride to get there. It was a very special experience and a lot of fun. For me tangling was something I always did alone but the seminar taught me that it can be also peaceful and quiet with more than one person. And I loved to see all the beautiful art works lying side by side on the table. My boyfriend never tangled before and he did a great job! Everyone complimented him on his art. I am so excited to try this official kit. I've been "searching" for an art form that doesn't leave me feeling disappointed with my skill for two decades! And that it is meditative - well, that is an incredible bonus. Thank you! -- M.P. I found Zentangle December 30, 2012. I'd just finished a quilt for my sister in law and was looking for quilt ideas for my next one. 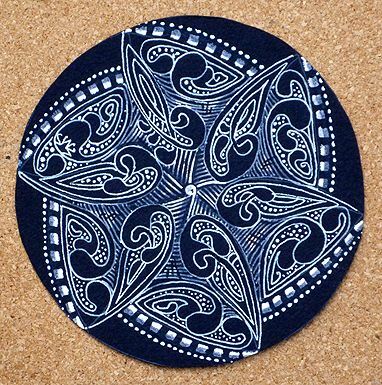 In a quilting blog I came across Zentangle, both as stitching and pen work on a quilt. The next day was consumed with searching all sorts on Zentangle. Needless to say it is now four months later and I haven't cut or sewn any fabric since. I've even added a drawing and painting corner to my studio, and it is currently the most used area of my studio. I've always wanted to draw and paint, but haven't had an art class since Grade 7 (32 years ago) and feel inadequate in my skills. I have now been creating art, whether it's a Zentangle tile or ZIA. Thank you so much for this technique, I no longer feel like a frustrated artist. I only experience frustration now because there are not enough hours in the day to create the avalanche of ideas that crop up in my mind!!! -- J.F. Thank you all for sharing your stories and your creations! We look forward to seeing what you create with these black Zendalas. We also look forward to meeting you at our gallery reception.